The cities of Brantôme, Périgueux, Bourdeilles and St Jean de Côle are among the must-see places in Dordogne-Périgord. Lots of other cities like Mareuil, Nontron and Varaignes are worth the visit for their castles, old fortified downtowns, museums and history. Brantôme, called the Venice of the Périgord is a charming village surrounded by the Dronne river. Brantôme, the south gate entrance of the Périgord-Limousin Natural Park, is one of the most visited tourist attractions of Périgord with a very rich architectural heritage including the famous benedictine abbey of St Pierre de Brantôme. You’ll find many restaurants and artisan shops in its old downtown streets. It is possible to canoe, swim or watch Friday night jousting on the Dronne river. The St. Front Cathedral, part of the UNESCO world heritage, and which inspired the architect of the Sacré Cœur in Montmartre in Paris, overlooks the city of Périgueux and the Isle river which passes through the city. From there, you’ll be able to start a nice walk of a few kilometres in the medieval city while discovering the historical heritage of Périgueux. On market days, you must visit the many producers in search of authentic local products. Many prehistoric men were living in Périgord. There are lots of artifacts from these times, from the Lascaux Cave to the Villars Cave where it is possible to admire authentic prehistoric paintings. Located around a loop of the Drone river, you’ll be pleasantly surprised by this fortress built on a promontory overlooking the nice village of Bourdeilles. While visiting Bourdeilles, you will discover two castles from two different periods (medieval and renaissance). And why not enjoy the local farmers market while visiting Bourdeilles? The St Estèphe pond is one of the biggest and most beautiful in Périgord. During warm summer days, visitors will have the possibility of swimming from a well-equipped and supervised beach. Possibilities of canoeing and pedal boating. Fishermen will be able to fish for pike or perch while hikers and bikers can use of one of the marked trails around the pond, at the Roc Branlant… Lots of beautiful hikes between water and forest. 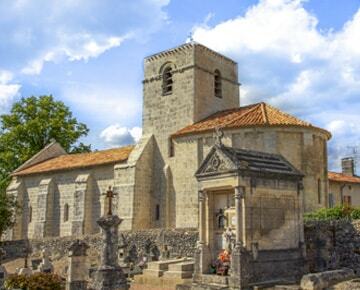 St Jean de Côle is ranked among the most beautiful villages in France. This medieval village will delight architecture and old stone buffs with its St Jean place, its church and castle typical of the 12th and 15th century. A wonderful stroll in old alleyways allows you to discover beautiful half-timbered houses all the way to the old bridge overlooking the Côle river.